Good morning, everyone! 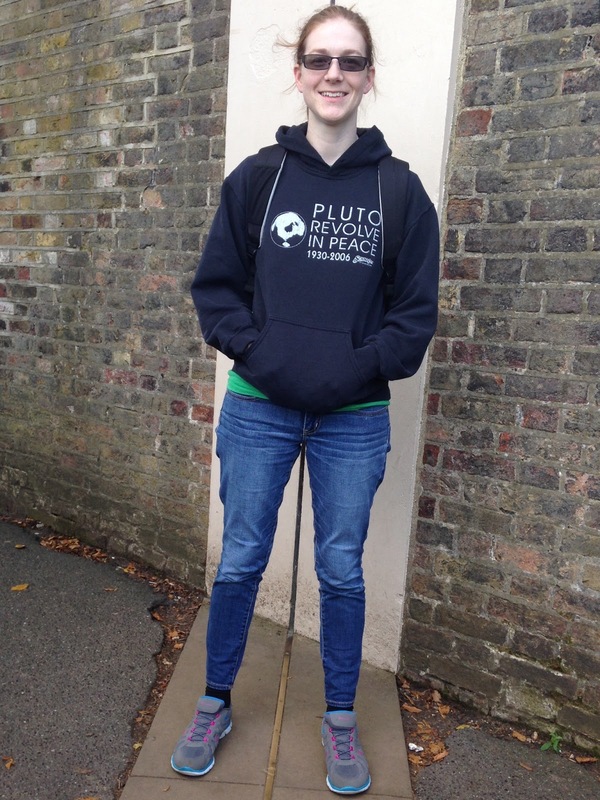 This is Matthew with the last of the actual posts of the "Surviving London" series. We hope to do a "What We Learned" wrap-up post about a week from now, just to give a brief synopsis of our overall thoughts. For now, I'm just going to give a brief rundown of our return trip. Our overnight stay at the Radisson Blu in Paris was great. The hotel was very nice and we enjoyed every bit of that. 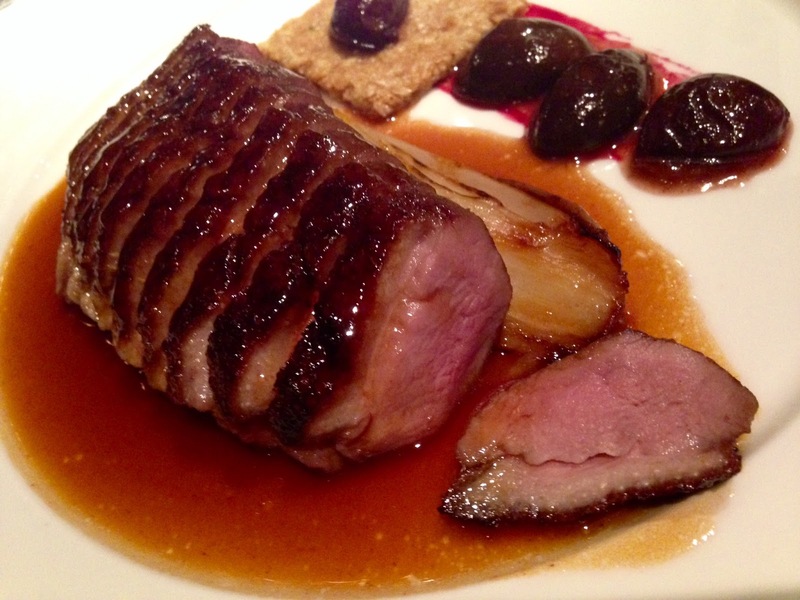 Although, it wasn't enough to undo the sour taste Paris had left us with. I'm still trying to get over that, if you couldn't tell. We took off from the hotel at 5:15 a.m., using the complimentary shuttle service to get to the Charles de Gaulle (CDG) Airport - or Aeroport if you're French. (We won't hold it against you.) The Radisson Blu is a bit further from the airport than we had originally thought, so it was a very nice service for them to offer. It saved us a few €25 taxi rides, anyway. The attendant at the hotel very politely informed us that the taxi drivers might attempt to pad that figure, so watch out if you're ever in that situation. Anyway ... back on track. We arrived at CDG about 2.5 hours early, and began our journey through security - which was actually pretty painless. Our flight departed at 7:45 a.m., lasting just more than three hours. We happily slept for most of that. The next leg - from Reykjavik, Iceland (KEF) to Toronto, Canada wasn't quite as nice - not trip-killing terrible, but not nice. First off, it was delayed for technical reasons - which is amazingly reassuring to hear when you're about to board the plane. The worst part is that from the departure gate, you get to watch them pull parts and pieces from the plane ... and some of those look kind of important. Hopefully they put them all back in there somewhere. A small interruption from Valeri: "Oh my gosh! This plane doesn't even have a phalange!" Other than that, KEF is a great airport. It's very clean, very modern and all around awesome. It is the home of IcelandAir - which also is awesome. We were lucky to have four different flights with them and we much preferred them to any other flight we've been on. The second thing that didn't go quite the way we had hoped was the fact we had three of the most ill-behaved children that I had ever seen on our flight. Once we saw them in the terminal, we both immediately expressed our concern they would be boarding with us ... and they did. They brought all of their rowdy kicking and screaming with them. They didn't stop all of the kicking and screaming for the entire flight. It got bad enough the flight attendants rearranged the passengers and passed out earplugs. Luckily, Valeri and I had our headphones, so we decided to take advantage of the in-flight entertainment. We watched a movie called Spy (hilarious), and a few episodes of Big Bang Theory. We just increased the volume enough to drown out the hellions - I mean lovely children - in the rear of the plane. We were dreading the next stop in Toronto. The Toronto-Pearson Airport (YYZ) is just horrid. It's too confusing and the baggage claim system is worthless. Our luggage should have been checked all the way through - like it is with any other flight in the whole world ... but we knew from our last flight through YYZ that all passengers have to re-check their luggage when connecting through this place. It's miserable. I'm not sure who designed that place, but I'd like to see him locked up for crimes against humanity - term: life. Some of you might think that is extreme, but trust me, it's 1,678% nicer than my original thoughts. As I mentioned, we knew the breakdowns in YYZ's systems, so we knew how to attack the beast. We went straight to one of the gazillion baggage carousels and waited ... and waited ... and waited. When our bags finally made an appearance, there was much rejoicing. I've learned I have absolutely no patience for airports and I think my poor wife gets the brunt of that. She knew what she was getting into when she said "I do." No refunds or returns, all sales are final. Sorry, Val. Interruption from Valeri: I told him a few times, "You already complained about that." He then replied each time, "I know and expect me to continue complaining." Then there was U.S. Customs. Oh, man ... that was a wicked process. It was so much easier getting into the U.K. The process doesn't leave much room for an incentive to return! The lines are far too long, the Customs Officers too few (although, we were very lucky to have a pleasant one) and the process far to convoluted. When you add that much complexity to a system unnecessarily, the single points of failure increases exponentially ... and when you're dealing with that many people (and their time and money), it's not a good thing. Once we got past customs, we encountered another wall. Literally. It was made of glass and was very much in our way. I contemplated the ramifications of removing said obstruction by utilizing a well-placed rock ... but the thought of being arrested in Canada put me off that idea. So, we stood there waiting for someone to move the wall - and eventually they did. That allowed us to get to our gate about 30 minutes before boarding began ... which brings me to another breakdown: There was no attendant at our gate. After we hit the 15-minute mark, I finally wandered over to another gate, and asked some questions. The response was, "Oh, someone should have been over there already." My immediate thought was, "Yeah ... that's kind of what brought the question about, genius." I'm not sure if he saw my eye roll or not ... and I'm honestly not sure I would have cared if he did. Evidently, airports bring out the worst possible version of myself. We finally boarded the plane - after sorting a seat assignment issue with Valeri's ticket - and began our short journey to Lambert Int'l Airport in St. Louis (STL). Lambert is a busy little airport! We either hadn't noticed last time we were here, or it was just way too early for the mania to begin. We made our way to the baggage carousels, grabbed our bags, then waited for our shuttle from STL to Columbia - which arrived right on time. That's it. We survived another trip! There were ups and downs, but the time spent in London made it well worth it. We absolutely loved it there and were blessed with pretty decent weather for most of the trip, so we had an awesome time. There is so much to see and so much to do - and there is no way we could have even scratched the surface with the time we had. If you ever have the opportunity to visit London, jump on it. You won't be disappointed ... and if you are, you're insane and need to forfeit your plane tickets to the Pearons. This is Valeri and this post will hopefully be short and sweet ... but I can't promise that. We woke up this morning sad to leave London. Matthew had threatened many times that he was staying and I just knew I'd miss the beautiful city. However, I was also a bit excited for Paris - Matthew was not. We both figured this is our one and only time to hit the "city of love" and then be on our way, never to return. Well, my excitement for Paris was wasted. Let's begin with the easy part ... the Eurostar. This part was simple and we had no issues. We were to St. Pancras by 6:40 a.m. and leaving the station on our way to Paris by 7:55 a.m. Although Matthew wasn't excited to see Paris, he was excited to ride the Eurostar. We stayed awake for about 30 minutes, then fell asleep, waking up about 30 minutes before arriving in Paris. Now, I'm usually an optimist ... so much so that it normally irritates Matthew (who is a realist). However, my optimism only lasted about two hours after arriving in Paris. After 1.5 weeks of London's tube system, we were experts and had no issues. Then we went to Paris where we had no idea where to even start and still had no clue by the end of the day. After finding our way to the hotel, we then had to find our way back into the city. I had scheduled our day to where we would only need to ride the metro three times (to our hotel, to Paris, back to our hotel), the rest of the day we would be walking along the beautiful Seine River ... something I heard we should definitely not pass up because it would be one of the best experiences we had. All the people who wrote that are full of it. There is a very small portion of Paris that is pretty and you're just wowed by the architecture ... the rest is nothing but graffiti. We even saw a tree covered in graffiti. Who does that?!?!? Anyways, I've sort of went down a rabbit trail here. Once we arrived in the city, our first stop was the library. It was once one of the largest in the world and from the pictures I'd seen, it was suppose to be beautiful. I did like it, but it was not the most beautiful I'd ever seen and in order to get to where the books were, you needed a library card, so I didn't get to see the room I was most excited about. So then we left the library and began our journey down the Seine River. Yes, the river is beautiful, but we were distracted so much by the trash and graffiti that our focus was pulled from the river. The first thing we came to though that was worth taking a photo of was the Cathedral of Notre Dame. Wow. It was beautiful. We made sure to stop and look a few times at it as we made our way along the bank. We then were suppose to eat lunch, which by this time it was already 4:30 p.m., so we figured it would be more like dinner. I had planned on us eating at Pizza Rustica, which was a block or two off from the river bank. Oh boy, was that crazy. There were so many people and the streets were very hard to locate, so after about 15 minutes of searching, we just decided on a different restaurant. I ordered a 4 Fromaggi pizza and Matthew had a pasta dish. The dishes were okay, but not great. After a mediocre lunch/dinner, we headed back toward the river to find the Pont des Arts (Bridge of Love). This is the bridge where people used to put a lock on the side of the bridge and then toss their key into the river. Just a year ago they started to cut off all the locks because the bridge was beginning to be unstable, so we were only able to see a few locks on the side of the stairs leading to the bridge. However, the view from the middle of the bridge was beautiful. We crossed the bridge and heading toward Place de la Concorde. It took us longer than expected to find it, but we happened upon the Louvre. We didn't go inside, but made sure to get a photo of the outside. This is where we started to enter the gorgeous side of Paris. The buildings from here to the Eiffel Tower were amazing. We couldn't help but be in awe of most of them as we walked toward the Eiffel Tower, which we arrived at right before sunset. Nothing can quite describe the Eiffel Tower. Even Matthew said he didn't think he would feel this amazed by it. The best part was a little after sunset when it lit up and then sparkled. The entire crowd all at once made a "wow" noise. Not even the greatest of poets could have described that scene. However, photos can give a small glimpse into what we saw ... just a small one though. After seeing the Eiffel Tower glimmer, we made our way back to the hotel and arrived ... 40 minutes later. Overall, the only things we liked about Paris was the Eiffel Tower and its surrounding buildings. We were not impressed with the city as a whole and don't understand what people see in it. I guess if you have the money to pay a taxi/uber to take you anywhere you want and you avoid everything other than the main part of Paris, you'd probably love it. However, if you don't have that option and you're just two people walking from the metro to the Eiffel Tower, avoiding being hit by cars (which almost happened twice even though we had the green light to walk) and not knowing any French, then this city probably isn't for you. I will warn you that this was the nice description of Paris. If you'd like to hear a non-sugarcoated version, speak with Matthew and he will be more than happy to tell you of his dislike for this city ... and his love for London. We head back early in the morning. I'm excited for my own bed and my couch. I also miss people who speak English. We'll be posting a blog soon about tomorrow's trip home, followed by one about our pros and cons of London and what we learned during our first time overseas. Good afternoon! Matthew here, reporting from London. Today was bittersweet. It brought an end to our London adventure, but will mark the start of our journey to Paris. I can't say I'm quite as excited as my wife is about France, but it will be a neat trip. We will only be there a day (closer to half a day, really) before heading back stateside. I'll give you a synapsis of today's adventure. We started with coffee at the Attendant. This place was quite a trick to find, as it is completely housed below the sidewalk ... and once you walk in, you realize why: It's a restroom. Yes, you read correctly. The entire café was built into a re-purposed men's lavatory. It took a second to figure out, but that made the name that much more clever. On one side of the room was the serving counter and on the other there was a sitting bar, with strange dividers between each seat - as it turns out, those were the tops of the old urinals. By the time all of this had sunken in, it was too late - I had already placed the order and couldn't carefully back out of the door, taking care to not touch anything. I'm sure they had doused the place in chemicals to sanitize it. I hope. Review coming soon. After the barista had prepared our coffees - which were prepared in an Aeropress, it was delivered to us in beakers and we were provided wine glasses for the actual consumption bit. That was a bit odd, but a neat touch. Unfortunately, the coffee (you know, the main point of this whole shop) was utterly terrible. I'm not sure what the barista had done incorrectly, but it was just bad. We forced it down, politely thanked the baristas - as they probably meant well - and went on our way. Our second stop for the day was the British Museum. This place was epic. The sheer size of the place astounded me. Valeri was very excited about the Egypt Exhibit, so we breezed through the rest of it to see that. While she was perusing the many artifacts, I wandered about the facility a bit and grabbed a couple of photos. Review coming soon. There was so much to see there, but we just didn't have the time to spare today. We began our trek to the next event of the day: The Monument to the Great Fire of London. This was a very neat statue, as you could choose to take the 1 billion steps (that figure might be slightly exaggerated for effect) to the top, and get a neat overlook of the city. Due to the weather and some death threats from our abused feet, we decided against the upward journey. The base of the statue is covered in massive inscriptions, detailing the fire, and the steps that the city's leadership took to mitigate the loss. It seems like the inscriptions were written by the people of the city, and you could tell how highly they thought of their leaders at the time. Review coming soon. The third event for the day was Bond in Motion. I was very excited for this one. The past 50 years of vehicles featured in the James Bond films were all on display in one place. We grabbed the audio guides and a detailed guide book. I have about a gazillion photos of this, but I'll only post a few here for you. If you want to see more, check out our PhotoStream by visiting CL3VER.life. as seen in "Die Another Day"
seen most recently in "Skyfall"
featured in the crash sequence in "Casino Royale"
featured in "From Russia with Love"
After we finished up Bond in Motion, we had free time for the remainder of the day, so we decided to just go walking. We walked through some areas we had already been, and some places that were new to us. We crossed over Millennium Bridge and Tower Bridge, then headed back into town to satisfy our stomachs' cry for food. We fed it Pizza Express ... which was decent. Review coming soon. After eating all of the food we needed, and then a bit more, we headed back to the hotel, and finished up what packing we had left, in preparation for a very early start to Paris in the morning. ...and that is that! London can be checked off our list, but we have hopes to return very soon. There is just so much to see here that it would take years to even begin to know what is going on - and this is just one city! With all of her quirks, weather oddities and strange inhabitants, we've really grown fond of London. As far as we've experienced in our short time, the pros of being here far outweigh the cons. It's a place we could definitely get used to ... but more on that later. Live from London, this has been Matthew Pearon. Tomorrow will bring greetings from Paris, so check back! Today was our "market day," along with a few little things we had planned to do between markets. Well, not everything went as planned, which has happened to us a few times on this trip. Surprisingly, with us being planners, you would think it would drive us nuts not sticking to the itenerary ... however, once we got the lay of the land, we didn't mind doing things exactly to plan. Take today for instance, our lunch and dinner ideas weren't at all how we planned and we did without the London Eye due to the rain. We started our morning as usual ... coffee run. 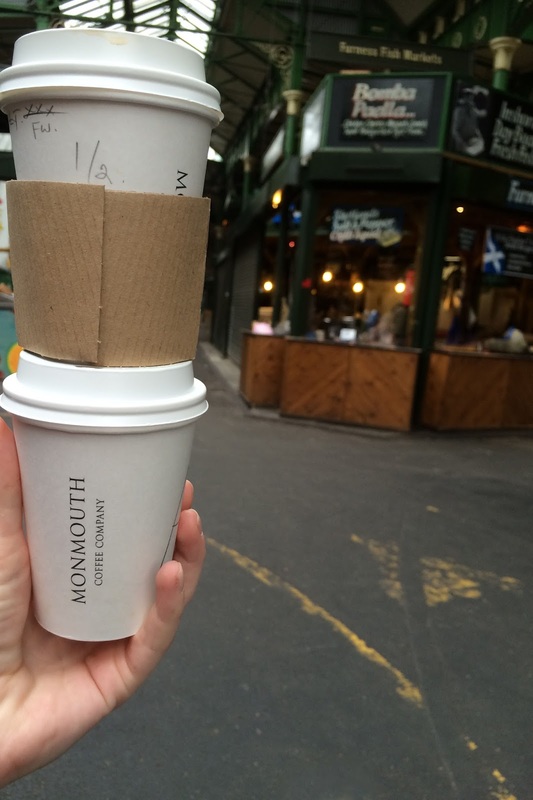 We went to Monmouth Coffee, which is right by our first market stop, Borough Market. Monmouth had a big line, which is the first time we came across a line at a coffee shop here. So there was a guy coming down the line making note of what everyone wanted. We couldn't see the menu to see if they had filter coffee, so we just told him two americanos. When we got up to the counter, we saw they had filter coffee ... bummer. Oh well, something to try from them next time we're in London. Other than the long line, the shop was cool and they were fast at getting us our Americanos. Click here for our review. 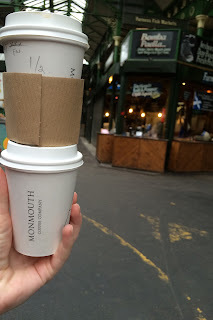 We then took our coffee to Borough Market, where most vendors were just opening. However, when we made our way toward the food, my goodness, plenty of vendors were ready with their yummy smells. Click here for our review. Since we had already eaten breakfast at our hotel (and it was only 10 a.m.), we decided to come back to this market for a meal later in the day. We then moved on to the Jubilee Market, which is located in Covent Garden. This market didn't really have food, rather antiques and little nicknacks. It was very close quarters, but they had some interesting stuff. Matthew found a whole table filled with classic books ... he loves me. However, that vendor knows how to price their classics. I wanted many of them, but knew I could come across them in the states for a smaller price. We came away from the Jubilee Market with one thing, but found quite a few interesting things. Click here for our review. We had already visited Southbank Centre earlier in our trip when we went to the book market, so we just went ahead and scratched that off our list to be able to spend more time at the markets. So we headed to Portobello Road Market in Notting Hill. This is the market I was most excited about ... I'm not sure if this was due to the actual market or that I had a certain Julia Roberts/Hugh Grant movie playing in my head. Whichever one, I was antsy to get there. We were going to go ahead and grab lunch while looking at what the vendors had to offer, but like I said at the beginning of this post, things change. We were disappointed by this market. We may have easily come on the wrong day for delicious food, but still, there was very little offered. Click here for our review. The things I found interested didn't even have to do with the market. The look of the place was awesome. The buildings were "cookie cutter" buildings, but what made up for that was that they were each different colors. I forgot to get a photo of that, but I'm sure one can be found online that will easily show what I saw. The other thing I found was George Orwell's former residence. We just happened to come across it while walking from the Tube to the market. Very cool. After the disappointment of the Portobello Road Market, we wanted to get back to the Tube so we could go back to Borough Market for lunch. 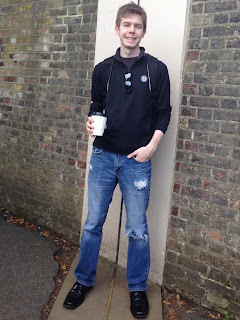 We grumbled most of the way back about Notting Hill, but that could have easily been due to us starving at the time (we both get grumpy when hungry). We finally got back to Borough Market around 2:30 p.m. and had a hard time deciding what to eat. Everything smelled so good, but one thing stuck out to us ... the Salt Beef sandwich. Our sandwich included pickle spears, raw cabbage and sprouts, swiss cheese, and salt beef ... all on a bagel. Matthew's also had mustard. Oh my word, spectacular. I'm not usually a big fan of pickles on sandwiches, but this one wouldn't have been as good without them. We have decided we'll be making these sandwiches as a tradition for St. Patrick's Day. Not sure if we can find Salt Beef in the U.S., so corned beef will have to do. Also, the woman making our sandwiches told me she liked my Luke's Diner (Gilmore Girls) hoodie. I know people overseas watch shows from the U.S., so that didn't surprise me too much, but then when she asked where we were from and we told her Missouri, she then said she has a friend in St. Louis. It's definitely a small world. After we finished our sandwiches and looked around a little, it was still raining, so we decided to head back to the hotel to start packing as much as we could of our bags. This way, we won't have to worry about it tomorrow night and maybe be able to get to bed earlier than we have been (before midnight). Due to being at the hotel around the time we were hungry for dinner, we decided to try a Chinese Takaway place on Caledonian Road (where our hotel is). It was okay, but nothing special ... mainly something to fill our stomachs. So that concludes our day. Tomorrow is our last day in London and we are sad we'll be saying goodbye to this city soon. Good afternoon, everyone! Matthew here. I'll be bringing you today's report from London. Good news! We will be adding the pictures in our previous blogs today, because our hotel's internet is behaving. If you're like me and like pretty colors and shiny things, browse back through them. Today's coffee stop was across the River Thames in Greenwich (pronounced "Gren-itch," not like "sandwich"). To get to the café, we had to use a new form of transport called the Docklands Light Railway - more commonly referred to as the DLR. Essentially, the London Underground trains and the DLR trains are identical - they even operate out of the same stations. The biggest difference is the DLR is not tunnel-bound. It is primarily above-ground and is usually on a raised platform. The other minor differences are the bigger car size and the lower frequency of stops. From what I understand, the DLR is operated by a company other than Transport for London. Video to come. After finding our way to Bueno Aires Café (read our review by clicking here), we ordered americanos, then began wandering around the area. There were several different markets or bazaars going on, so we stopped at a couple of them to look at all the trinkets people were trying to sell. Largely, it was the same type of stuff you would see in the states. I don't know what I was expecting, really ... all salt and pepper shakers have the same basic design! We did find this very cool World War II-era record player that was still in working order. Video to come. By the time we finished with the markets, we had already grown quite fond of the area ... but then we moved on to the park surrounding the Royal Observatory and that's when it became a love affair. The whole area is just gorgeous. It sits about 20 minutes (by Tube and DLR) away from London Proper, so it's significantly quieter and more laid back. I'm not sure what it would cost to live in that area, but that is where we think we would want to live if we moved to London. I see a lot of GoFundMe campaigns these days for some ridiculous things ... perhaps I should spin one up for Relocation of the Pearons! We began the up-hill journey to the Royal Observatory, walking on a footpath beside a road we never saw a car on ... only bicycles and a long board. It was just amazing how quiet the place was. The top had a great overview of London and some beautiful gardens ... but the exhibit was not free ... and the only real reason we wanted to go in there was to see a specific timepiece and the Prime Meridian. We ended up exploring the area a bit and discovered that beyond a gated area, the Meridian Line had been extended down a wall, and onto the ground in front of the building. Sure, the skyline was missing, but the point was the line on the wall, right? Click here for our review. Our stomachs started letting us know it was time for a bit of sustenance, so we made our way back into Greenwich (remember, not like sandwich) to find our scheduled lunch venue, Heaps Sausages. It was a small restaurant, with only four tables and twice as many chairs. I ordered the Bangers and Mash with Onion Gravy and Valeri ordered a Cheeseburger. It was very good and you can see what we rated it by clicking here. We were then off to explore the O2 and the Emirates Airline and Aviation Experience. The airline is a cable car service that runs over the River Thames, between the O2 and the Royal Docks. We were pretty disappointed by the Aviation Experience - which turned out to just be a glorified entrance to a gift shop. They did have a flight simulator, but it was £45.00 to try out, which is approximately $70 ... so we passed on that. Click here for our review. The airline was very neat, though. It landed us very close to a Tube station to take us back into central London to eat supper. Supper was at DF/Mexico, which was very good. Valeri had the Chicken Tacos and I ordered the Grilled Chicken Burrito and a Horchata. Read the review here. After supper, we snaked our way around the River Thames, taking a few pictures of the building made famous by the James Bond Series, MI6 (Ministry of Intelligence, Department 6). MI6 is the equivalent of the United States' CIA; whereas MI5 operates like the FBI - inside the boundaries of the Greater UK. Until tomorrow, this is Matthew signing off! Hello, everyone! This is Matthew again. Sorry to mix things up on you, but we've switched nights so I can pay attention to the Doctor Who series nine premier - which I will be watching "live" for the first time! Yes, people ... I'm a Whovian. Embrace the geek. On a frustrating note, we will be unable to attach photos to this blog or post our venue reviews, as our Hotel's internet connection is being unreliable ... yet again. We will get them posted as soon as possible. Now, on to the rundown of today's activities. To start things off the right way, we made a coffee run to Costa Coffee, which seems to be the UK's Starbucks equivalent. It wasn't bad coffee, by any means ... but I could sense the corporateness in the air. We both ordered americanos, as they did not offer a standard drip coffee. We've come to realize that drip makers are just not a thing over here. Several of them offer filter coffees brewed to order, but they are generally quite a bit more expensive than most of the other drinks on the menu. We sat in Costa for a few minutes to enjoy our coffee, then headed on our way. 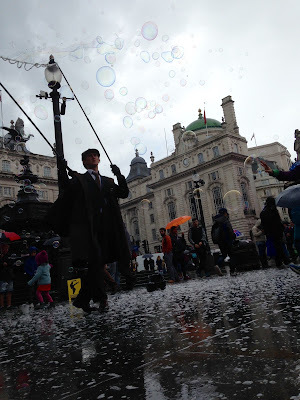 We had a bit of free time scheduled into the itinerary, so we took a wander around the Piccadilly Circus area. There are so many neat statues and sculptures at random intersections or along fence lines in the strangest of areas. Crests are absolutely everywhere, and it's awesome. Valeri and I were discussing whether or not this would still be in practice in the more modern monarchs' reigns. There are plenty of ERII seals around the city, but most of them are on bollards, lamp posts or gates ... not many on statues. Will this die out or will the next few generations of the Crown continue to add to the array of ornamentation? We were still a bit too early for our next scheduled event, so we kept wandering and stumbled across the changing of the Rear Guard, which was quite a production. One of the oddest things we encountered during our free time was a young Sherlock Holmes forming big bubbles in the middle of Piccadilly Circus with a fancy bubble-making contraption. We then headed to grab a bite to eat at Planet Hollywood. The place was covered in memorabilia - which included two whole walls dedicated to the actors who have portrayed James Bond and the actresses who have portrayed the Bond Girls. We simply weren't all that hungry, so we split a Garlic Pizza ... which turned out to be little more than very thin pizza dough covered in oil and a dash of garlic, then fried. Not terribly exciting, but it was something to munch on. Click here for our review. After our snack came the important part of the day - the James Bond Walking Tour of London. It was about two hours packed full of very interesting facts and great photo opportunities. Our tour guide provided great insight into the life of Bond's creator, Ian Fleming; showed us a ton of filming locations; and even provided some behind-the-scenes photos of the SPECTRE filming. Click here for our review. MI6 is shown in the background. It was a very neat tour and comes highly recommended by the Pearons! It was food time again, but there was bad news ... I had forgotten to bring cash for our scheduled eatery, as they did not accept cards ... so we had to make some changes. We found a place called Nando's. Now, we think Nando's is a small chain, and eating there breaks our rules (no eating at chains/fast food while on vacation) ... but it was worth breaking them. They serve chicken and chicken-based dishes, but the way they spice it is absolutely phenomenal. Valeri ordered 1/4 Chicken with mashed potatoes and chips (not crisps, mind you), and I had a Lemon and Herb Chicken-stuffed Pita. 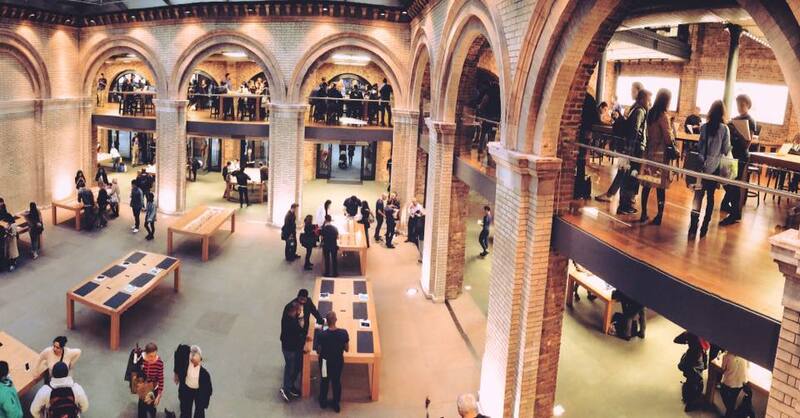 Our next scheduled event was the Apple Store. What a facility that was! It was in the middle of Covent Garden, so the building was very, very old ... and everything housed within was very, very new The contrast was great. The place was crawling with Apple Care people who seemed very friendly and eager to help, and had some pretty neat gadgets laying around. We didn't have any structured plans after the Apple Store, so we just walked around. Rugby season had just started up, so the pubs were packed to the streets with people cheering and carrying on, which was very cool. While passing through Trafalgar Square, we stumbled upon Malaysian Night 2015 and got a video of one of the performers singing his rendition of Adele's Skyfall. There were a lot of people, and a lot of good smelling food, so that was a great way to end the night. Again, we are so sorry about not including photos ... those will come as soon as we can get them posted! Now, it's getting pretty late here, and my eyes are beginning to get heavy, so I'll leave you in peace and go ahead and catch some rest before tomorrow's adventures come knocking at our door. A little spoiler for you: There will be bicycles, there will be penguins and there will be fancy dress. You figure out the order.